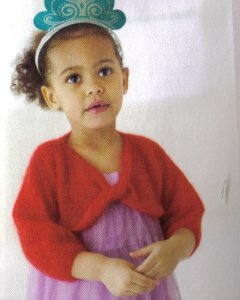 Taken from Debbie Bliss Knitting Magazine - '11 Fall/Winter: "This little red riding shruf has real party presence. It's worked in stockinette stitch in one piece from the left sleeve and twisted in front for that dressy, swirly look." This pattern is in Debbie Bliss Knitting Magazine - '11 Fall/Winter, page 92. Size US 3 straights, US 6 straights, and stitch holder are required but not included. Finished Measurements Across the Back: 10.25 (11, 11.5, 12)". Color Shown is 20 Scarlet.